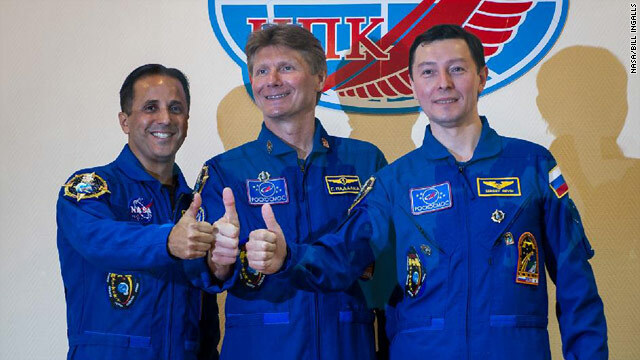 NASA astronaut Joe Acaba and Russian cosmonauts Gennady Padalka and Sergei Revin give the thumbs-up before their launch. There are three more men in space Tuesday than there were 24 hours ago. Monday night at 11:01 p.m. EDT, the remaining three members of the Expedition 31 crew launched aboard the Soyuz spacecraft and are now on their way to the International Space Station. NASA astronaut Joe Acaba (@AstroAcaba), as well as Russian cosmonauts Gennady Padalka and Sergei Revin will join commander Oleg Kononenko and flight engineers Don Pettit (@Astro_Pettit) and Andre Kuipers, who are already aboard the ISS. Monday night's launch, from Baikonur Cosmodrome in Kazakhstan, was preceded by the usual pre-launch activities: the crew signed the door of their crew quarters, were blessed by a Russian Orthodox priest, and said goodbye to their families before getting their suits checked and boarding the spacecraft. If you missed it (or if you didn't and just want to see it again), NASA's posted the video of the launch. The Soyuz will reach the International Space Station and dock on Wednesday at 12:38 am EDT. It is very low to make fun of the program which you (Americans) are continuously using.. kind of ungrateful.. be consistent.. In every TV series there are negative rhetorics about Russians.. get over it, the cold war is over.. stop being afraid and abandon your negativity..
Hey, it's our new PRIVITIZED space program in action. The Russians are more than willing to take our cash (most of it Taxpayers) to send Americans into space. But wiht the worries of a monopoly we better see if some one can come up with a lower bid. Hey China? Fly safe our friends (USA and Russia). Imagine if they got there and it was gone. You make a good point sometimes I pdeonr if it's better to have humans constantly in space doing arguably non-dramatic (non-inspirational?) things vs. having no humans in space at all for some time (say, a few decades). The former might not be the most exciting but we are establishing ourselves as a space-bound species, continuing to live/work in that environment. If we stop doing that for a generation, wouldn't a future generation simply try to get back to space, do even less, and then call it success?Similar to dave's comment above having people stationed at a research outpost, which happens to be in space, is really cool. In a way, it's awesome that it's ordinary .Now, whether or not that's worth the $$$ and our return with respect to science the arguments against it are compelling. At the very least, this budgeting stuff gets people talking about it. when they find oil in space then we will advance our program, but right now there is no profit in space and that is why this capitalist country are not interested in spending money for the sake of exploration. "Traditionally, Soyuz crews fly with a small toy hanging from the top of the crew compartment that acts as a gravity indicator"
Instead, Americans use a $1.7T gravity detector system. I thought the launch site was in Derka-Derkastan. I wish they would stop calling them astronauts, they are all cosmonauts now. Need not worry. The Italians call them " Specimens". So when do we get to "visit" the space station that WE built again? Yeah!!! Same with all the fighter jets, nuclear submarines and strategic bombers armed with nuclear bombs that we payed for! And yet they are make fun of Russian space tech on the Big Bang Theory... You know, Russian didn't ask you to board their "crappy" rocket. You paid to ride that. Russian spec tech deserves to made fun of. America’s DECICION to ride with the Russian is an economical one. Where is Russia’s space shuttle? Russia abandoned their space shuttle program when they realized it was dangerous and a money sink. DOn't make fun of the Russian maned space program. They have a very good record and right now they are the only country with a manned program of any kind. The Russians were smart to find a way to keep the cost at a level where they can afford to continue with launches. The Americans never learn that lesson and end up canceling project after project when the costs start to run away. He is, he was out getting some Fruit Loops! Shameful that the U.S. has no means to send our own astronauts to space and instead must rely on the Russians! All thanks to The Anointed One! Not his fault completely...Young Man Bush made the decision to quit flying shuttle, and even if Constellation had been continued, we'd still be another three years out, at least, from putting men into space with our own rockets and capsules. Dunno that Obama had anything to do with it, since the decision to stop launching the Space Shuttle was made during Bush's reign. get your facts before opening your pie-hole, monkeybrain. Didn't know Jesus was cutting budgets and cancelling programs. So, why would you call George Bush "The annointed one"? I'm confused. And so a new era begins. One where NASA is irrelevant, the US collapses and the other nations of the world take over. Finally!! The world will stop getting exploited and bombed by us. If you traveled around the world, I think you would find that a great many more people have been killed by others than those in the United States. more countries have been attacked by islamist than by US. We knew that was gonna happen a long time ago. All empires fall, as witnessed by the Greeks, Romans, British, Germans, etc.... and now the Untied States. Bush made sure this process was expedited. Now would be the time to start learning Chinese.